Well, Saturday was a good day with a well attended conference called Epicuriosities regarding local/sustainable foods. The panel I was on was well represented by farmers, advocates, and a large scale produce company. I have to say there was some very spirited debate which is beneficial to all food-kind. Unfortunately, student representation was very small and only helps to solidify my concerns with the apathy towards a more healthful environment and food supply here at Rice. All the more reason to make the changes to the health and wellness of food regardless of the student input since I receive virtually none. A common theme among speakers was the notion that we should eat what we need rather than what we want… This of course is the opposite in our real everyday lives... We certainly do not eat at Taco Bell because we need to, but rather because we want to. After thinking for a few day’s about this, I am more convinced that University Dining in general and here at Rice should be focused on menu’s that are sustainable to our health i.e. what we need. It is often easiest to serve food that students want in order to appease the masses, but this does little in the way of education about dining and nutrition. The question of local sustainable food from Houston was heated and while I listened to several view points, I believe that the larger corporate model wins out here… The fact that 80% of all in-season produce comes from California speaks volumes about why we can’t produce here in Texas at a higher rate. After all, if we could, we would! What does it take to shift the sources of food? Climate and soil conditions must be altered. This of course is not going to happen and we must make other considerations of which I am unclear about. A little about what I call “funny looking food.” One vendor brought carrots straight out of the ground that were grown organically. They were absolutely beautiful by the way. Guess what though? They did not all look the same and had legs and fingers growing off them. One student mentioned this to me that those carrots looked funny and would prefer to eat a more uniform carrot. 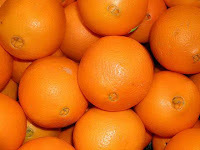 I find this is the same with Texas Oranges that are slightly off-colored, but sweet anyway. The students would not touch an orange unless it was bright orange in color because this is what society has trained us to view an orange as. In order to become more locally-centered around food, we must get over our preconceived notion that all food comes out of the ground or off a tree the same shape, color, and size at all times. The reason we see it this way in the stores is due to the sorting procedures of processors. All in all, I believe that once our preconceived notions about how food is supposed to look, we can return to our roots and enjoy slow food even if it is slightly off color or has an extra arm or leg growing from it. I am not referring to GMO products; just the natural order of things that grow in the ground or on a tree.